These notes accompany a in-depth feature. For profiles of South Africa’s regions and dozens of estates please see Regional report: South Africa 2013. I did something of a double take when Paul Nichols and his wife Rebecca Tanner walked through the door to meet me in the tasting room of Mulderbosch. 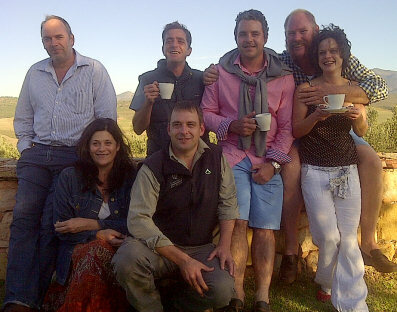 When I last met up with them it was as the winemaking and viticultural team behind Tulbagh Mountain Vineyards (TMV). Knowing that today I would be meeting representatives of Fable Wines, a new name from the Tulbagh area under the same ownership as Mulderbosch, what I had not realised was that Fable wasn’t a new start operation, but more a re-branding of the highly respected TMV. In fact, TMV was the first South African property acquired by Charles Banks, a label that had a considerable reputation already both domestically and in Europe, but which was far less well-known in Banks’ native USA. The change of name is part of the re-branding to attack export markets, not only the US but the UK too where Fable are currently not represented. I got the sense from talking with Paul and Rebecca during the tasting of their wines that this young couple who have lived and breathed the sensitively and organically-farmed Tulbagh vineyards for many years now, are still coming to terms with a change in direction, perhaps to a more ‘plush’ style that the new owners might demand. Though they did not comment on that, it is clear that they remain as passionate and dedicated as ever to their remote and beautiful estate, where 15 hectares of vines at an elevation of 500 to 600 metres are just one part of a rugged 180 hectare farm that is also home to cattle, sheep and horses. They remain focused on organic and biodynamic farming too, with some Tulbagh Chenin Blanc going to Reyneke and other estates. The Fable web site suggests the couple have braved “fires, baboons, leopards, poisonous snakes, and isolation,” in pursuit of the perfect wines, and indeed I personally witnessed the first two of those on my visit in 2010. It seems this couple have grit and determination to spare, and the progress and perhaps changing style of wines they make under the Fable Wines label will be one to watch. A blend of 55% Chenin Blanc, 16% Grenache, 16% Chardonnay, 9% Viognier and 4% Roussanne, all natural ferment, each proportion vinified separately in barrels, steel and concrete eggs, about 33% goes through malolactic. From old Swartland fruit mostly and Paardeberg. 175 Rand retail. Lovely touch of honeyed richness to this, that lovely fat apple fruit that is appley but very ripe, those hints of tropical pineapple touches and still that lovely freshness with a little herbal nuance. 90/100. Delightful nose, very pure and fresh, and a little more floral, and that lovely ripe orchard fruit, pear and a touch of melon and Asian pear. Just a nutty background. Delicious on the palate again, the nutty orchard fruit is the driving force, a really like the thread of acidity that is running through this, juicy and tangy. There is still a bit more barrel component to go into the blend apparently, but I love the freshness and fragrance of this. 90-92/100. 80% Syrah, 20% Mourvèdre. All estate fruit, 10 years old. Delightful nose, the ripeness and creamy, rich chocolate touched fat of the wine is very appealing, there’s an appealing touch of violet and lifted kirsch, and also an underpinning earthiness. Delicious juiciness and ripe, fresh black berries that are balanced by some dry, slightly ashy tannins and acidity, that add a lovely cut of freshness. 175 Rand locally. 89-90/100. 100% Syrah. More closed than the Lion’s at this stage, lots of cedar, lots of classic, really well defined lightly earthy quality. The palate has a racy twist of liquorice and endive adding dramatic dark bite. Lots of juicy dark cherry fruit, fine acid balance again and the tannins adding enough roughening presence whilst being ripe and really quite fine. A tight baby at this stage that needs a few years, but lovely concentration and balance. 310 Rand locally. 91/100. Some Grenache added in this vintage – a GSM blend. An overlay of oak at this stage, giving a little more vanilla, but lovely purity of red and black berries beneath. Big, plush palate, lots of espresso and plum, but juicy, the fresh points of cherry and liquorice really sharpening the finish. Juicy in the finish, the weight and concentration of the palate is lovely in a generous wine of great. 88-90/100. A touch of Viognier in this, blended back from the subsequent vintage. A nice touch of the peachy quality of Viognier, but not dominating at all, not floral or peachy. Fine cedary background, the solidity and rasping freshness of the black fruit – lovely tart elements as well as sweetness – is really good. A twist of liquorice and endive again here, also a little charry oak quality adding depth, and this has length, spice and concentration. Arguably a little more Barossa than Rhone, but it does not lack elegance or freshness in the finish. 91-93/100. As we wander through the older, more industrial cellar beside the glistening stainless steel temple of the newest one, Wilhelm talks openly about the sacks of oak chips I see lying in a bay, even agreeing to open up a sack of used chips to show me how they look having done their job. There is a sense of openness about the commercial side of the operation that for visiting journalists would once have been shuttered behind the marketing spin of top wines, the Manor House and the sculpted lawns. That is refreshing. Western Cape fruit from Darling, Philadelphia and Durbanville plus Elgin. Quite a rich and tropical nose, with exotic fruits and an almost creamy note. Quite fresh on the palate, a wisp of smokiness perhaps, but a piercing fruit quality with a lot of tangy, lemon rind freshness. Very nice concentration and lip-smacking, juicy finish in a nicely balanced, dry SB. 87-88/100. Darling and Durbanville, 7% Semillon from Philadelphia. 3/3/3 new oak, 2nd and 3rd fill. Quite a dominant oak character, lots of almond and marzipan, a touch of mealy, smokiness. Big blast of ripe nectarine-like fruit on the palate. There’s a juicy, fine apple coolness and acidity too, adding a lovely smoothing balance, with a touch of spice and a touch of nuttiness in the finish. 89/100. Morrisons. Quarter each from Swartland, Durbanville, Paarl, Darling. Part fermented in foudre, part in barrel and 25% through carbonic maceration. Nice deep yellow/gold, with bright lemon rind and apple skin fruit that seems tangy and fresh, some nuttiness and a hint of toffee too, I prefer the oak handling on this. On the palate the there is a honeyed sweetness to this, and there’s a dry, apple-core finish that is dry and succulent, a bit of fat. 89/100. Based on Sauvignon Blanc, Chardonnay and Semillon (60%), with Viognier, Riesling (30%) and with Muscat, Gewurz, Chenin, Verdelho or Nouvel – it changes. Parts of the blend are barrel fermented and aged. The best wines of the vintage are put on the table and selected. Creamy oatmeal leesy character here, a lemony character too, seems light with a touch of floral character in a gentle complexity. The palate has a freshness, a poise and a succulent juiciness that has some flesh and has some sour orange acidity adding a bracing, slightly saline character. An interesting wine that has both weight and creaminess, but the finish has that salty, freshness and subtle intensity. 92/100. From Philadelphia. Very nice schist, cool, peppery aromatics. \Tight blackcurrant fruit beneath. There’s a fat, sweet black fruit suppleness, with a rounding chocolate and coffee beneath, and a nicely grippy and tangy, lots of bracing acid and tannin bite adding a lovely freshness to a big wine. 89-90/100. From darling, A Fairtrade wine. A little more blunt on the nose, with plumier, less fresh fruit quality, a bit of meat and leather too. The palate has delicious tangy freshness again from those well-handled tannins and fresh plum skins grip, but there is a bit of meaty quality here, the fruit plumier and more full, and finishing with a bit of heat and plenty of spice. 90/100. Exclusive for Swedish monopoly. Grenache, Carignan, Shiraz, the first two old bush vines, from Swartland and towards Wellington, Shiraz from Philadelphia. A little baked and leathery on the nose, a little nutty note, then good fruit comes through, black and red fruits but very solid. A touch of meatiness. Lots of full, confiture sweetness on the palate, a chocolaty richness and juicy quality, a big raft of savoury, racy fruit despite the big-scaled quality of this wine. 90/100. In Morrisons. Paarl fruit. Fresh cassis and black cherry, not too much oak on the nose, but there is a subtle pencil-shaving/smokiness and touch of chocolate. The palate has full fruit sweetness, quite a nice elegant cherry edge and chocolate note, but then an awful lot of slightly raw oak dominates the palate, with the wine finishing on oak spice and tannin dryness. 86-87/100. 60% Cabernet Sauvignon, 25% Merlot the rest Petit Verdot and Cabernet Franc from within Paarl. A little bit of woodiness and smoky oak at first, a touch of cedar. Quite an intense fruit beneath, with the palate nicely juicy and fresh – much more fruit focused than the Manor House, the spiciness is there and those plum skin bittersweet notes, but the fruit drives through melding with spice and a touch of chocolate to add depth to the finish. Lovely stuff. 91/100. 50% Sangiovese, 45% Barbera, 5% Nebbiolo. Fermented separately and into old 500l barrels, then after a year it is blended and back into barrels for a few months, mostly Romanian with a touch of American. Does capture the lighter cherry character of these grapes, with a smoothing infill of vanilla, and a touch of the Sangiovese tobacco in the background. The palate has lovely texture: it is creamy and quite plush, but medium-bodied and has a sense of red and black fruit to give a little freshness. Is the oak a little too charry just in the finish? But then the juicy cherry acidity is excellent and it finishes long and focused on fruit. Very good and will age, power but supple precision. 89-91/100. Only 10.8% abv. Chenin Blanc with Semillon, Riesling and Gewurz, and a little Muscat. 200g/l residual sugar. Toasty orange aromas, lovely barley sugar and those leafy touches of tobacco and tea leaf. Gewurz perhaps adding a touch of exotic Lychee too. Deliciously creamy and sweet, but has freshness and a bit of lemon and apple bite over the luscious honey and delicious length. 92/100. 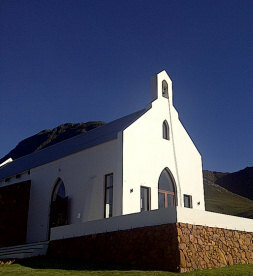 The Solms-Delta farm in Franschhoek is a unique place, part wine farm, part cultural centre, part social experiment focus. Co-owner Mark Solms (right) says he left South Africa “in the bad old days,” returning only after the fall of apartheid to the farm that he says is “home, in every sense.” Mark describes his mission with Solms-Delta as being “to fix this little piece of South Africa.” That includes the museum, which tells the frank story of its history: the indigenous people who were dispossessed of the land on which the farm stands, and the slave labour that built it. He explains that in South Africa today owning a farm like this is “semi-feudal,” with the owners having responsibility for the people who live on it – some the direct descendants of those early slave workers. A black-dominated trust owns one-third of the farm and there are fee-paid education programmes, after-school centres, a traditional music club and a restaurant which fuses flavours of the region’s European, Asian and African traditions, all supplied from the farm’s culinary garden. 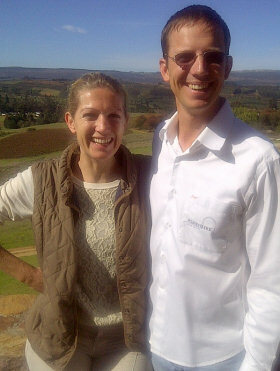 Winemaker Hagen Viljoen joined me for a tasting over a delicious lunch. 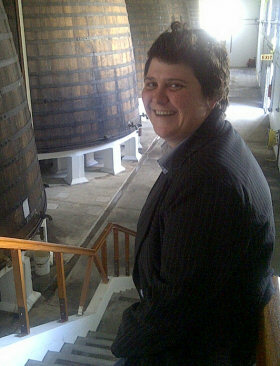 Hagen worked on Bordeaux’s right bank and at Vergelegen estate, and has been on board here for less than a year. 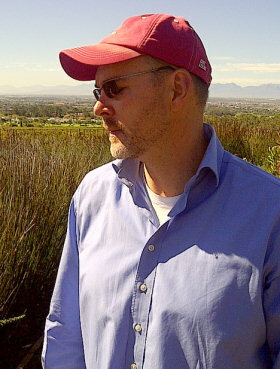 “With Solms-Delta I want to refine the concentration and focus of the wines,” he tells me. “Traditionally the wines here had a slightly oxidative style. I want to sharpen that up a little”. The farm’s 32 hectares of vineyard supply about 50% of its needs. In truth, Hagen has inherited a really mixed bag of products spanning ciders and sweet commercial wines to quite serious bottlings. It is a confused portfolio and one senses that part of his mission over time will be to refine both the products and, possibly, the range. He seems bright, experienced and capable, and the appointment of ace viticulturist Rosa Kruger as vineyard consultant all point to an estate that is well worth visiting, but also wines that are worth watching. The blend is 55% Viognier with Roussanne and Grenache Blanc. From 2012, Hagen has sourced some new Grenache Blanc grown on decomposed granite that is of such high quality that will probably become the dominant grape. Sweet attack, the Viognier having been in French oak adds a little richness, very forward and rich, but precise and fruity, a touch of nectarine and orange brightness, and then a lemon zesty core with lovely brightness. 89/100. Mourvèdre, Grenache and a small proportion of oaked Viognier. Very attractive, dry, cranberry and redcurrant fruit, dry and earthy, with a touch or raspberry, and a really nice full. Quite red-wine like and very nice finishing acid balance. 86/100. Made from Packhams pears grown on the farm, this 6% abv Perry has light, fresh pear and apple aromas. A dry finish here, matched beautifully with the basil and vanilla creaminess of a soup we ate with it. 86/100. 40% Shiraz and Mourvèdre, 33% Grenache with Cinsault and fermented on the skins of Viognier. Big, rich, ripe black berry nose, but then there’s the crisp, bright focus to the acidity and the fruit on the palate. 88/100. Desiccated Shiraz. Hagen pinches the stems to let bunches dry on the vine. Rich and deep, not so raisined as an Amarone perhaps, but a lovely blue/black fruitiness. Very smooth, and 14% abv gives a rich texture and a blue/black focus to the finish that keeps it pure and really quite fresh in the finish. Tannins fully ripe and acidity pretty good too. 89-90/100. With 9.5% abv this is a strange concoction: it is carbonated and sweet with quite a clean and creamy with an effervescence, a nice juiciness from good ripe fruit, finishing sweet with 40g/l of residual sugar. 85/100. Desiccated Shiraz is fortified by grappa. Little high floral notes, very grappa, deliciously rich chocolaty wine with good length and the spirit nicely handled. 88/100. KWV was founded in 1918, and soon became a huge player in Paarl as the largest cooperative cellar, and went on to become one of the biggest wine producers in the country through both popular brands and a small range of very high-end wines that were amongst the Cape’s earliest ‘icon’ bottles. KWV, owned by its grape growers, became a powerhouse of the South African industry. As wine writer Michael Fridjhon wrote: “[KWV] managed the minimum pricing system, the maximum permitted yields per farm, the wine shows and competitions, the drafting of wine-associated legislation and most of the country’s wine exports in the apartheid era.” But times change and KWV faced governmental and industry pressure to give up some of its power. After many a long battle, in the 1990s that started to change, including conversion from cooperative to publically owned company, but it also marked a period of steep decline including KWV being implicit in the ‘flavourants scandal’, guilty of adding flavours to its Sauvignon Blanc. Something had to be done, and KWV put together a board of ‘mentors’ including senior winemaking figures Neil Ellis and Charles Back who began to re-engineer the company and its products. KWV also embraced empowerment, with a black empowerment consortium taking 25.1% of the company in 2004, then new cellars were built for making premium wines in 2007. KWV’s rehabilitation was under way. I met up with bright and confident winemaker Izele Van Blerk in the ‘Sensorium’ an impressive tasting and art gallery space within KWV’s Paarl HQ that opened last year. Izele is responsible for KWV’s top red wines including those under the Mentors range (“where the focus is terroir, climate and varietal expression,” says Izele) and the iconic ‘Perold’ label. Interestingly, and I suspect much to her bemusement, Izele has also been given the responsibility for KWVs portfolio of RTDs (Read to Drink mixed drinks and cocktails). I guess that is all part of the flexibility needed in a megalith like KWV that is constantly trying new things to change the business. Before we returned to HQ for a large tasting of only the top wines in the KWV portfolio, a tour of the Mentors cellar were they are made showed the state of the art equipment and substantial investment there has been in recent years, even though we also passed through some far less impressive old facilities. Clearly KWV is on a journey, with much remaining still to do. Perhaps a little crisper and more citrus on the nose, with passionfruit and gooseberry, but hinting at the tropical again. Seems a tiny bit more dilute on the palate, or rather less concentrated, but with a racier character and a lovely bug lime blast ion the finish. Very dry and juicy, and a lovely vibrant but slightly more vivacious expression. 89-90/100. 80% of blend fermented with indigenous yeast, only 10% went through malo. Barrel fermented and matured in barrel, nine months, 50% new. Big programme of regional selection and barrel programmes to find the right style for Chardonnay. Hazelnut and cream on the nose, plenty of orchard fruit and a hint of lemon and minerals too. Delicious blast of sweet fruit, but a big squirt of orange juice acidity, shimmering and long but is there just a tiny note of cloying sugar in the finish (4.04g/l) so probably just ripe sweet fruit. 89-90/100. 65% Paarl fruit, 35% Swartland. Two components fermented in barrel, one with indigenous yeasts, three further months in barrel for these after blending, but one third tank fermented. Subtle and nutty, some Cox’s Pippin fruit. The palate has an intense sweetness of fruit, a real hit of honey and the vanilla and cream adding to the impression of sweetness. In fact only 2.88g/l sugar, but overall impression is sweetness despite a very good, dry apple acidity. 89-90/100. Fermented with Rhone yeasts in tank, half way through, 60% moved to barrel, all older barrels. No malolactic. Lovely nose, apricot and a touch of marzipan/almond, those custard and apple pie aromas more than overt fruit. The palate is sweet and ripe, a touch of dilution just in the finish perhaps, but an interesting and successful style. 88/100. 90% Stellenbosch fruit, 10% Paarl. 18 months in oak, 85% French and 15% American, 70% new oak. Very attractive nose, with a nice cherry and red fruit brightness, a hint of red liquorice, and a touch of char, but not coffeeish. The fruit is very sweet, but there does seem to be a lot of oak here, massively sweet fruit, elegant cassis and cherry, quite refined chocolate tannins and a bit of spice, and it does feel a touch hot in the finish perhaps, though the ripeness is delicious, it perhaps lacks just a touch of structure and the acid is a little lemony. 88/100. 83% Paarl fruit, 10% Swartland, 7% Banhoek, 25% whole berry. This goes into barrel for 18 months, 85% French. Nice kirsch and cherry brightness of red fruit, with a very ripe profile, added to by the creamy oak overlay. Oak arguably a little dominant on the palate, this is very creamy and ripe and richly chocolaty, masses of big Barossa power. 89/100. From Stellenbosch area. 18 months in 70 new French oak. Has that lovely green twist and olive character of the Cab franc, in a big wine with some black liquorice and black berries nicely there, oak seems quite nicely handled. The palate has a lovely juiciness, but I really like the leaner, green touch here that keeps everything on an edge – more of an edge than the Shiraz, with a long finish, not showing the heat too much. 90/100. Stellenbosch, Paarl and Bot River fruit. 16 months in French oak, all new. 47% Cabernet Sauvignon, 22% Cabernet Franc, 17% Merlot, 9% Petit Verdot, 5% Malbec. Very nice nose, tight and glossy black fruit, but quite refined, creamy oak and a touch of cedar, a hint of game or leather in the background. The palate has massive fruit sweetness, real luxe black fruit flooding the palate in creamy concentration. There’s a sweetness here that is almost too much for my taste, though there is a nice balancing tannin and acid. 90/100. 40% Shiraz from Paarl, Swartland and Stellenbosch, 30% Pinotage, 15% each Cabernet Sauvignon and Cabernet Franc, spending 18 months in 90% French, 10% American, 70% new. Dramatically dark colour. Touch baked in quality perhaps – seems Shiraz to me – quite subtle, but the oak nicely handled and the creamy quality of the fruit being offset by a touch of smoke or subtle meatiness. The palate has a massive fruit presence, with delicious mid-palate sweetness, the power of the wine is obvious, the concentration, but the big drying effect of powerhouse tannins is delightful, acidity good adding a cherry bite, and the oak just fills in on the finish to support with some coffee and spice. 92-93/100. 18 months in barrel, 85% French and 15 American, 300+500, 70% new. 100% Shiraz. Very lifted, cherry and violet aromas, with a touch of real gamy perfume, this has nice Shiraz character and Shiraz perhaps, but buoyant and juicy. I like that red berry and cherry fruit as it continues on the palate, plenty of structure here, squirting juiciness, but lots of structural tannin and acidity keeping this very fresh, very juicy and concentrated with lovely spice and structure, but in some ways more elegant. 93/100. Tinta Barocca, Cinsault and Sousão that spends 8 – 10 years in 300 and 500 litre barrels. 17.5% abv. Deliciously chocolaty and walnutty stuff, with massive sweet raisings at the core, coffee and toffee. The palate has gorgeous walnut and raisin sweetness and depth, coating with espresso and mocha and 128g/l RS, but such fine balancing acidity and spicy heat. Delicious and long and a stunning bargain as it costs around £3.50 per bottle locally. 91/100. But winemaking eventually found him, even without formal training. “My first vintage in 2007 was supposed to be Chardonnay, Sauvignon Blanc and Pinot Noir, but all but my Sauvignon went down the drain because of elementary mistakes I made.” And what led him back to wine? 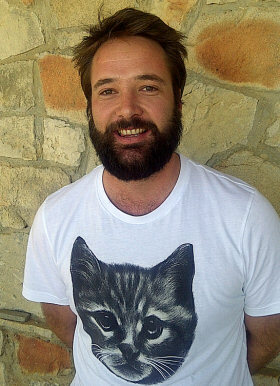 “I went to work for Eben Sadie’s winery in Priorat,” he tells me, “and then to Burgundy for Comte Armand, and suddenly I realised that I had to take this seriously, and that it was what I wanted to do with my life.” Peter-Allan says that working with Eben Sadie “Really showed me the poetry of wine again, and got me really fired up.” Peter-Allan shares his small and simple winery with Chris Alheit, and for the moment buys fruit from plantings in Hemel-en-Aarde, a farm near Bouchard Finlayson with some really old vines, and yet more very old vines planted on slate soils in Villiersdorp. From three vineyards, and as with all of Crystallum’s wines, it is wild fermented with no added acid. Peter-Allan used only 2nd fill barrels in this vintage, but says he would be comfortable using 10 – 15% new oak. It has a beautiful nose with gorgeous hazelnut and ripe, ripe apple fruit, a hint of the tropical – guava and pineapple – but beautifully tempered by cool citrus and salt. Delicious palate too, the lime and lemon juice clarity and the hints of fatter fruit, waxy lemon, but the oak just adding a nice spicy edge that rather pleasingly disrupts the purity of the wine, the finish showing a bit of grip and a touch of tannin to end on a serious note. 92/100. A single vineyard that “Does what it says on the tin,” according to Peter-Allan. Tighter, more purely focused on the mineral and tight fruit, the oak sitting lightly. Orange and fruit skins, with some nice waxiness, but, again the hints of more tropical fruit comes through on the nose. Really nice fruit on the palate too, that slightly more austere character is there, but there’s a lip-smacking, lemony concentration and purity, the almond and oatmeal softening edge of the oak just fleshing out the finish. 93/100. Made with 20% whole bunches and a long maceration on skins, with Peter-Allan saying he is “not working the pumping over too hard.” It’s a blend of two Hemel-en-Aarde vineyards. Instantly appealing, it has a little beetrooty and nicely vegetal quality as well as some truffle and the fine red fruits, hinting at spice and chocolate. The palate has delicious fruit, with dry tannins, that little touch of chocolate and spice is very flattering, but his has such lovely fruit sweetness and balance. Delicious. 90-91/100. Named because the vineyard is on a site used to film a big movie about Napoleon Bonaparte. From a five-year-old vineyard, it has lovely tightness to the fruit, a black berry quality with some lifted notes of clove and kirsch-like cherry, that fine truffle and gently beetrooty quality. Some cassis here in a concentrated style. The palate has delicious focus too: there is such a pure line through this wine, the softly smoky oak wreathing around that deliciously dark but not heavy fruit, plenty of dry acidity and a bit of roughening tannin to maintain and edge, the soft juiciness of the fruit pushing back through to dominate the finish. 93/100. From a four-year-old vineyard, this has a little more dark, liquoricy tones to the nose, with a pure black fruit and touch of floral and violet, yet really ripe and blackcurranty and direct. There’s a coffeeish tone too, making it fairly plush for Pinot, with plenty of ripe, sweet, mouth-filling fruit and more weight and texture, plenty of spice too. Oak is the same, with 30% new, but seems to be a little more charry and deep, giving this a big, spicy finish where the sweet, sweet fruit pushes through. 91/100. The fruit for this comes from the Swartland. It is a Rhône blend, though Peter says it will “not necessarily always come from Swartland.” It’s a blend of Syrah and Mourvèdre. Wonderful lift, the kirsch and violet perfume is beautiful, a nice dark cocoa edge and plenty of tight black fruit. The palate has an equally tight juiciness, that lovely slick of earthiness and cherry skin bite to the acidity, the tannins coffeeish and smooth, but really a very attractive, concentrated and fairly big wine of great substance. 92/100. A blend of 92% Chenin, 8% old vine Semillon including fruit from the Stellenbosch ‘Radio Lazarus’ vineyard and from slate soils in Riebeek – “From old bush vine Chenin from across the Cape,” according to Chris. Stunning nose, beautiful custardy touches to the clear, limpid, lightly buttery apple fruit, touches of golden raisin and deliciously inviting creamy clarity. The palate has that beautiful layer of sweetness and ripeness too, such beautiful natural concentration, with a steely core of citrus and dry apple, but has a seductive hint of plushness. Great length and, in the end, delicious. 92/100. A little more Semillon in this, but the same range of components. pH of 3.37. Freshness comes from hydrogen ions – that’s pH – not really from total acid. Very different on the nose at first, with a slightly more musky note and slightly more buttery, but starts to soften into a much more complete picture. Deliciously tangy and fresh, with hints of that austerity that Chris says is exactly how the 11 looked early on, but he suspects this will be a little less plush than the 2012. The fresh, energetic probing acidity of the crisp, fresh finish is really decisive, really vibrant. 91-92/100. From the old 400 metres vineyard planted in 1978 in Stellenbosch that I tasted from barrel. Delicious nose, layered with a little vanilla and almond paste, but tiny floral notes, then the palate has huge presence too lots of raciness and nutty concentration, but a complete, rounded wine with no gaps. 93/100. Newton Johnson is very much a family affair. Started by his father in the 1970s, today Gordon Newton Johnson and his wife Nadia are making the wines and brother Bevan is in charge of the business side. Their vineyards and winery offer stunning views to a distant Table Mountain, and are farmed on very careful, sustainable lines with biological controls minimising the need to use chemical treatments, such as an introduced population of ladybirds cleaning up more harmful insect pests in the vineyard. The Newton Johnson vineyard runs to 18 hectares, mostly on decomposed granite soils with a band of clay deeper down, and a few very stony sections – up to 80% stones in parts. Between them, Gordon and Nadia have chalked up considerable experience including time spent in New Zealand and California. Their hugely impressive portfolio of wines is built around Pinot Noir, and they also make wine on contract for other fine growers in the region including the excellent Shannon Vineyards. I asked if anything much had changed in the winemaking philosophy since I last met up with Gordon and Nadia in 2010. “Well, from the 2012 vintage we’ve been playing a little bit more with stems and whole bunch ferments for the single vineyards,” Gordon tells me. That experimentation is clearly paying off as the 2012 Pinots tasted are terrific wines that seem to have ramped up complexity. A blend of 86% Sauvignon Blanc from elevated vineyards on the estate and 14% Semillon from Elgin. Very fresh, barrel fermentation of the Semillon component with natural yeasts doesn’t give too much oaky character, but does add a touch of lemon and lanolin roundness to the aromatic picture. The elegance and freshness of the palate is delicious, with lots of fat lemon and lime, a touch of delicate herb or nettle, but savoury acidity running through to a pithy finish. 90/100. This wine sees 10 months in oak after a wild yeast barrel fermentation, and is made only from estate fruit. Gordon say he did not need to adjust acidity in this vintage, but would if needed. Beautifully delicate cashew and almond, with the oak deftly handled, nutty and allowing the creaminess and ripe orchard fruit to come through with a hint of savoury saltiness. Superb palate too, lots of delicious nectarine juiciness and sharper apple tang, completed by a citrussy, grapefruit and orange acid brightness and, tight, savoury oak. 92-93/100. All wild ferment, and Gordon says “it is worked very lightly, we are not going for a lot of extraction.” Lovely light colour. Beautiful nose of soft truffle and gentle rhubarb and beetroot vegatility. Charming little smoky and tobacco influences and berry fruits. The palate has soft and elegant fruit, with delicious cherry and soft, dry red cranberry nuances. The finish balances the crispness of cherry acids, fruit and a touch of that earthy smokiness. Nicely maturing. 91/100. More custardy notes here, with the oak a little more obvious aromatically, the fruit seeming a little riper and more black fruited too. Lovely juiciness and a tighter profile, deliciously tight focus on the palate too, a sheen of oak giving just a little more focus and concentration. Deliciously long, arguably a little bigger. 92/100. Fruit not quite so forward here, more about gentle earthy spice and cedar. Some dry redcurrant and a touch of raspberry perhaps, and some definite herby/spicy notes. The palate is clean, lean and juicy. There’s a really nice freshness to this, some delicious tang and vibrancy, the long, fresh finish touched by cherry and floral notes too. Lovely. 93/100. Youthful aromas, but slightly vegetal rhubarb and beetroot notes are there, lots of Pinosity and a nice truffle background. The oak is beautifully fragrant too, incense and Sandalwood touches. There is mouth-filling, creamy and silky texture on this, with very good fruit and that lightly truffly richness and texture nutty and long. Bright acidity cuts through the savoury richness and supple tannins. 92/100. Delightful nose, a touch of fudge and a touch of chocolate even, with those lifted, burning incense aromas from that so nicely chosen oak. The palate has the same fullness and richness of texture, but the cherry and herb-touched dry crunch of the fruit and racy, tight focus of citrus pith and mineral tang gives excellent balance. A very good vintage this. 92-93/100. From lighter soils where roots go deep, with 5% of clay beneath decomposed granite. Fresh and tobacco-spiced, lightly leafy nose, the oak has the usual exotic fragrance, with the inclusion of stems (possibly?) adding just nice little herbal notes that add another element of complexity. Wonderfully fresh on the palate too, with a sweet-fruited appeal. There’s a lightness of touch to this with cherry and almost rose-hip elegance, and a lovely finish – long and beautifully poised. 93/100. 13.5% Our ‘Flagship style’ wine according to Nadia, coming from their oldest vineyard which has a good depth of soil with 30% clay. Much darker and more dramatic, with a touch of toast and nicely ashy, incense-like oak. Not heavy, the purity of the fruit more about juicy summer berries than fatter, blacker fruit. A lovely elegant, exotic spice but definitely more firmness, more structure here. Juicy orange acidity and fruit quality, the tannins fairly grippy and robust but tight, the structured finish balanced between fruit and the layering of that tobacco and spice. 94/100. From a vineyard only four kilometres from the sea with their shallowest soils over thick clay. Very tight on the nose, the wood adding just a sheen of polish to glossy fruit which is the driving force along with little pinpoints of clove and spices. Pure on the palate, this is all about the clean, tight, quite glossy ripe fruit, but then that structure comes through, the ripeness of the fruit matched by a little vegatility. Really fresh but powerful in the finish, an extra half degree of alcohol evident, but the balance is retained. 92/100. Made from Syrah and a little bush vine Mourvèdre, Gordon says this might have Grenache in future too. This barrel sample comes from a very stony portion at the bottom of the Windansea vineyard. “It’s almost all rock – not suitable for Pinot,” says Gordon. It has a dramatically dark colour, spice and meatiness, with really deep, glossy black fruit and a little tobacco coming through, a sprinkling of pepper too. Lovely juiciness on the palate, big ripe black fruit flavours with a twist of liquorice and plum-skin tang and tartness giving a bittersweet twist to the finish. 91/100. 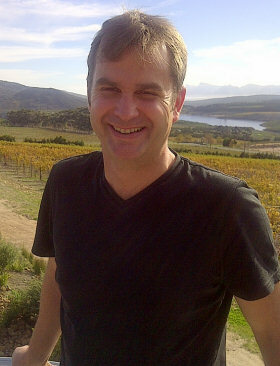 Kevin Grant is the iconoclastic owner and winemaker at the Chardonnay obsessed Ataraxia. Even his new visitor centre caused a bit of a stir locally, styled as a church complete with bell tower and stained glass windows, some of his more religious neighbours disapproved: “But it’s part of the architectural vernacular of the region,” says Kevin. “This was a poor sheep and wheat farming region. When I bought the farm it had only a few very dilapidated buildings.” There is something intellectual and, if I may say so, rather priest like about Kevin, something that suggests a rigorous but spiritual character. The name Ataraxia means ‘Serene state of mind’, as exemplified by the winged, ethereal angel that is the label’s design and logo. Standing looking down over the vineyards towards the sea, he explains how the morning mists roll in right over the vineyards here on the Hemel-en-Aarde Ridge. At around 400 metres and with some cooler, south facing slopes, this is a cool site, further freshened by constant breezes from the sea. 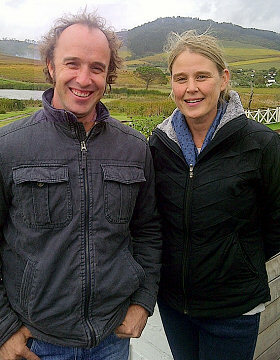 “We harvest a good bit later than other neighbours in Hemel-en-Aarde because of these factors,” Kevin tells me. The former winemaker at Hamilton-Russell, Kevin’s obsession with Chardonnay began in Burgundy when he worked a vintage with Jacques Prieur in 1995. There he had the opportunity to attend a vertical tasting of Montrachet: “It was so inspiring, moving through vintages of young wine to the complexities of the older wines, it made me want to make Chardonnay that can age and become more interesting.” To that end he treads a different path from many other Chardonnay producers in the region. he is unapologetic about acidification of the juice: “There’s no point in presenting a 4×4 wine to the market,” he says (that’s a wine with a pH of 4 and total acidity of a lowly 4g/l) as acidity is one of the essential keys of ageability. I’ve backed off from 100% malolactic, and there’s a discreet but essential use of oak. Kevin does make a little Sauvignon Blanc (which he also wants to be ageable – “I don’t think the vintage date on the label should also be the consume by date,” he says) and Pinot Noir too, but I was honoured to be the first journalists to be shown the full range of every vintage of Chardonnay Ataraxia has ever made as the crux of my tasting. 13.7% abv, 31% new oak. Very dry, cool ripening season. Delightfully nutty and creamy nose, with a touch of orange and oatmeal. Beautifully precise, the fruit is so tight, mineral-flecked and lemony. There is that core of juicy tangerine and lemon zest that has a certain ripeness, but the acidity and freshness is what drives this, the nutty touch of oak just fleshing out the mid-palate and finish. Precise and delicious. 92-93/100. 13.15% abv, 30% new oak. Variable year, cool at first then very hot towards the end. Delicate, nutty incense nose, more almondy with ripe highlights of apple and lemon, but a real sense of delicacy here. Welter weight of acidity here, the lime and lemon freshness and the pithy dry acidity running right through the wine, but on the mid palate those lightly creamy notes and fleeting nuances of nectarine and mandarin orange add sweetness. Delightful. 91-92/100. 13.6% abv, 31% new oak. Very tough vintage, rainy. Has almost subsumed the oak completely on the nose, with duller aromatics. Has the fine blast of freshness and high acidity again to make it lemony and refreshing, but no doubt this is simpler and relatively lean without the complexity of the first two wines. 87/100. 13.9% abv, 34% new oak. “Supposed to be the best vintage ever – cool, dry and late.” Showing a deeper colour here, moving towards buttercup yellow. This has the highest total acidity of all, at 7.8g/l. Honey and gentle nuttiness here, with a note of oxidation, softening the picture with gently floral notes coming through and apple fruitiness. The palate has that light oxidative quality again, nutty and orangey, with a fine core of lemon and mineral acidity. This comes together really nicely, showing maturity and perhaps not for keeping, but beautiful nutty fruit and still fresh. 91/100. 13.8% abv. 33% new oak. Some grapes sourced from Elgin (40%). Long, wet and late vintage. From this vintage on there is a lot of deep, buttercup colour to all the wines, especially the 2006 and 2005. Lovely nose, developing a buttered and lightly vegetal Burgundian character, with those lightly cabbagey notes delightful against the citrus. On the palate there seems to be plenty of fruit sweetness, a little layer of honey and almond against the fruit, and delightfully fresh and poised in the finish. Maturing and lovely. 91/100. 13.5% abv. 37% new oak, 40% Elgin fruit. “Coolish vintage, elegant wines, small berries.” Very refined, very elegant, with just a hint of toast to the cool, mineral aromas. In the background there is something very dry and appley, a very appealing profile. The palate has crunch and vigour, the freshness of the acidity streaking through the lightly nutty and slightly oxidised notes, with a real squirt of lemon zest and pithy grapefruit acidity. 92/100. 13.6% abv, 36% new oak. 50% of fruit from Tulbagh. “Very cool vintage indeed, a bit of rain.” Quite a deep colour, but nose seems pretty fresh, again those hints of buttered cabbage, Burgundian character that hint at more vegetal qualities, but lovely in this context. Just a little almost minty note from the creamy oak in the background. On the palate lovely silky texture here but light, that bracing core of tangerine orange and lime really streaking through. Terrific elegance and energy about this wine at this stage, lean but not mean, with a terrific, long finish. 93/100. 14.1% abv, 37% new oak. From the only commercial Chardonnay vineyard in the country in Tulbagh/Ceres area that is planted on its own roots. “Short, hot and early vintage and quite challenging.” Not quite so giving on the nose, less opulence to the fruit (though this is all relative in the context of these precise and quite steely wines), with orchard fruits and a touch of background nuttiness. On the palate the oak is perhaps a little more prominent than in other vintages, but not heavy or excessive, adding a glimpse of coffee and toast, some complexity here, the fresh and savoury quality of the nuttiness and the sour tang of the acidity is beautifully done. Terrific stuff for a 13 year old wine. 92-93/100. The fruit for this wine comes from a farm next door the township in Elgin. Lovely fresh nose, with passionfruit and hints of guava and mango, with streaking freshness and beautiful, limpid texture, there is no overt green character, just a touch of soft green herb perhaps. Lovely palate, sweet, sweet fruit, with a beautifully refined and textured finish that is succulent. 90/100. I met up with five contrasting, but high quality estates of Hemel-en-Aarde, including originals Peter Finlayson of Bouchard-Finlayson and Anthony Hamilton-Russell of Hamilton Russell, as well as newer players Creation Wines, Sumaridge and La Vierge. Spread across the three sub-zones of Hemel-en-Aarde – Hemel-en-Aarde, Upper Hemel-en-Aarde and Hemel-en-Aarde Ridge – the dinner following my tasting was a delight, especially as the Pinot Noir flowed and good natured arguments about the vines, wines and politics of the area ensued. Though the estate is no longer in his ownership, Peter Finlayson remains at the helm of Bouchard-Finlayson, and of course remains one of the founding fathers of the entire region, his Sauvignon Blanc, Chardonnay and Pinot Noir blazing a trail for Walker Bay for a couple of decades. It was interesting to hear Peter and Anthony Hamilton-Russell, another stalwart of the region, cross swords in a good natured way with the others, particularly the not so shy and retiring JC Martin of Creation Wines, over the surprising diversity of grape varieties they have chosen to plant, from Syrah and Mourvèdre to Sangiovese and Nebbiolo. These varieties certainly do not follow the Pinot and Chardonnay masterplan. It is surprising. This region is one of a tiny band around the world that has carved out a reputation for excellence with Pinot in particular, a grape variety that has also come into vogue over the past decade and which surely promises very good returns to those who make it well. Perhaps this dilution of ‘Hemel-en-Aarde = Pinot Noir’ is a mistake. Producers in other Pinot hot-spots around the world, from Central Otago in New Zealand to the Willamette Valley in Oregon, toe the Pinot party line. But then the other estates present occupy the Upper Hemel-en-Aarde and Ridge appellations, with slightly different soils and climates, so maybe their Rhône and Italianate blends will have the last laugh in years to come. The clay soils of Hemel-en-Aarde do not lie on limestone à la the Côte d’Or, but nevertheless their very low vigour and maritime-cooled climate have proved excellent for Pinot and Chardonnay. It’s clear that Peter in particular regrets the move to plant Syrah and other varieties: “We had the opportunity to become the Martinborough of South Africa,” he says somewhat wistfully. 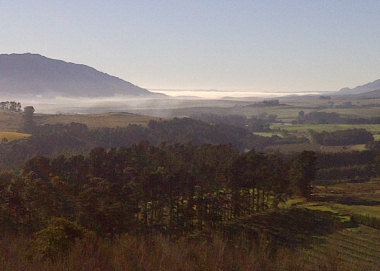 Above: fog rolls in to Hemel-en-Aarde. UK importer of Hamilton Russell is Hallgarten Druitt. See all stockists on wine-searcher. A very fragrant style this, the oak sweet but floral too, with a minty freshness to the fruit, notes of apple and pear, Asian pear perhaps, spiciness following. The palate has that freshness nicely handled too, with the lemon and lime juice of the fruit flooding the palate, then a creamy but delicate infill of oak. This is vibrant and juicy, the lemon zest squirt of acidity fresh and shimmering. Seriously Burgundian stuff and delicious with concentration and energy. 92-93/100. More subdued aromatically, the taut apple fruit and light layer of vanilla and cashew on top, but misses the 2012’s vivacious aromatics a little. On the palate seems full and harmonious, with a smooth texture and lovely natural concentration again, very nicely resolved and very well done. 91/100. A little exotic incense here, quite subtle aromatics at this stage, but the berry softness and delicate chocolate, tiny spicy notes. On the palate it is taut and focused, the juicy freshness of the fruit is lovely, just sprinkled with an exotic, delicate spice and clove seasoning, running through to a juicy, well-balanced finish. 91-92/100. Seems a little darker and more solid in colour. Seems a little bigger on the nose too (though alcohol identical) with rich berries tempered by some earthiness and hint of truffly development. The palate has really nice, sweet, full and rounded fruit, the berries and cherries filling the mouth, wrapped in a sheen of vanilla almost hinting at coffee, but then the elegant but quite pert and grippy tannins and acids freshen the finish. Very juicy again, and drinking very nicely. 92/100. UK importer of Bouchard Finlayson is Seckford Wine Agencies. See all stockists on wine-searcher. Elegantly fragrant oak, the exotic spices and hints of gently wreathing woodsmoke and vanilla are lovely. On the palate this has plenty of sweet fruit, lots of very ripe melon and moving towards tropical, but then the lovely freshness of the acidity in the finish really comes through, fresh and mineral, giving real light and shade to the wine and a long finish. 90/100. Fresh, fruit forward aromas, orchard fruit freshness and just background creaminess and hazelnut nuances. The palate has lots of lemon, lots of pithy crisp and dry acidity, the picture taut and nervy in a quite Burgundian mould, with a sense of burgeoning fruit sweetness that will emerge with a year or two in bottle. 90-91/100. Not a terribly clear Pinot nose, seems a touch oxidised perhaps? Not singing, a bit overripe possibly, but there is a rich berry essence beneath. On the palate the acidity feels a little raw, perhaps against that slightly oxidised fruit quality. Decent length, and has attractive components, but doesn’t totally convince at this stage. 88-89/100. A blend of 51% Sangiovese, 13% Pinot Noir, 13% Shiraz, 13% Mourvèdre, 6% Nebbiolo and 4% Barbera. Again just a little oxidised feeling, a little baked perhaps, the fruit a little too solid for the Blend? There is a lot of sweet, rich, full and ripe character here on the palate, but I cannot escape those slightly oxidised notes once again. 88-89/100. 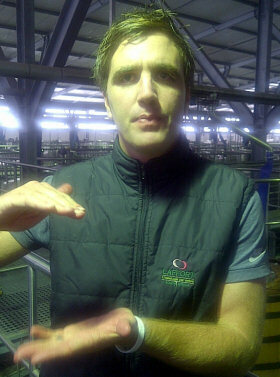 UK importer of Creation Wines is Copestick Murray. See all UK stockists on wine-searcher. Very attractive, gently truffly and damp undergrowth nose, a hint of chestnut and soft smokiness, but nice and soft red fruit beneath too. The palate has a little stripe of something liquoricy, with a nip of astringent quality that is freshening, the juicy endive edge adding to the cherry fruit. 89/100. Youthful, tight, mineral quality here, a touch of game but tight and lean on the aromatic profile. The palate has lots of fruit forward appeal, a soft sheen of vanilla and beneath a tight core of fruit. There is that firm liquorice, endive bite again, a house style, giving this a fresh finish. Potentially very nice, finishing with soft spice and good fruit. 90-91/100. Youthful, tight and focused aromas, big plum and more cherry skin black fruit, something a little like caraway seeds. The palate has a juiciness and plenty of rasping, fresh edged cherry fruit and tannin just adding a pleasing roughness. It is a big wine style, with plenty of alcohol, the oak underpinning with a bit of extra char. This finishes with a fairly big and grippy style. 89/100. 14.7% abv, with all of Creation’s wines around the 14.5% mark. A nicely jammy and sweet fruit note on this – not overdone, but just suggests ripeness to come, along with a nuttiness from the Grenache and plenty of fruit to the fore. On the palate this has a silky texture, the extra confiture sweetness of the Grenache leavening the forthright, powerful Syrah style. Juicy acidity and freshness, very attractive, wearing the alcohol slightly better I think. 90-91/100. Sumaridge is imported by The Wine Company. See all stockists on wine-searcher. A blend of 55% Sauvignon Blanc, 25% Chardonnay, 15% Semillon, 5% Viognier grown on part sandstone, part granite. 40% fermented in older barrels with natural yeast. Lovely clear and ripe nose with some oatmeal and nuances of honey and wild blossom, very attractive. The palate has a lovely limpidity, clean and very juicy, tangerine and lime freshness and lovely racy acidity. The oak adding just a softening sheen to the crunchy fruit and freshness of the finish. 90-91/100. Ten months in barrel, 35% new and all Burgundy barrels. From granite soils with quartz. Combination of spontaneous and inoculated yeasts. Gentle battonage. Hot buttered crumpet toastiness, with nutty apple fruit and a hint of pineapple and more luscious ripeness. The palate has lovely clarity again, the fresh-cut apple freshness and juiciness of the acidity lovely against the creaminess and the mandarin orange tang. 91/100. All Burgundian coopers, 33% new wood. Granite and clay soils, weathered to chalky texture. Careful hand sorting, both spontaneous an cultivated yeast, some in closed steel fermenters some in large oak, mostly whole berry. Pleasing colour and pleasing nose with some delicate coffee and earthiness, a dry cranberry fruit and delicate spices. On the palate this has medium body and it is in a lean, savoury and has a lemony freshness. Perhaps a touch more acidity or less fullness of fruit than I’d ideally want, but lovely citrus. 88-89/100. A heftier 14.7 abv here. The blend is 55% Shiraz, 45% Pinotage matured 18 months in 225 and 500-litre barrels, all French and 50% new, and whole berry fermented in large oak. Very nice spice and cedar, quite peppery and rich, an earthy tone too and plenty of ripe berries. The palate is flooded with creamy red and black fruit, juicy and has a lovely choc finish with very nice balance if a little lacking in plumpness. 89-90/100. La Vierge is imported by The Wine Treasury. See all UK stockists on wine-searcher. Plenty of nicely mid-way style here, with juicy fresh fruit and a hint of grassiness, but quite restrained too without too much tropical flamboyance. The palate has lovely fruit too – an easy, relaxed style of SB, but with precision and a fine limey cut of acidity. fresh with that gooseberry tang and dry finish. 88-89/100. Softly inviting and very discreetly oaked, with juicy fruit of apples and pear, a touch of riper melon, and just that fine sheen of oak adding oatmeal and cashew. The palate has deliciously sweet fruit, lots of tangerine and nectarine that is exotic but juicy and vibrant, lovely tangy finish too. Very nicely made and well balanced stuff with juicy, pleasing appeal. 89-90/100. Fine, rounded berry fruit, with gentle oak, truffle and light smokiness, the palate showing a nice fruit balanced by leafy and vegetal notes that are quite Burgundian, with a dry cranberry finish and really nice balance showing light spice, good acidity and a savoury finish. 90/100. The blend here is 60% Sangiovese,30% Nebbiolo, 10% Barbera. Ripe but also has a nice tang of tomato leaf giving a little welcome and bright edge to the fruit. Some creaminess, cherry and a bit of elegant cherry fruit with hints of tobacco and spice, nothing overtly oaky. The palate has a flood of sweet fruit: real juicy berries and fat red cherries, then a chocolaty infill from the oak is lovely, giving this a broad and full appeal, but the juice and freshness of the Italian grapes does freshen the finish nicely. 90/100. Whilst my tasting with a group of Hemel-en-Aarde producers later the same evening was a slightly formal affair – the rest of the group discreetly disappearing to allow each producer a bit of one-on-one time with me, usually spent in silence as I attempted to taste a total of 20 wines in one hour – the tasting with the Bot River band was a much more rumbustious affair, all gathered round a huge table and all chipping in, and occasionally heckling, as I tasted through each of their wines. 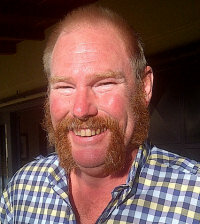 That informal, jovial tone is exemplified by the man mountain that is Niels Verburg (below), owner and winemaker at the regions’ leading estate, Luddite Wines. Niels greeted me sporting a frankly scary assemblage of facial hair. Just the weekend before the region had hosted its annual ‘Barrels and Beards’ festival, a harvest festival with a difference where winery workers in the region (and beyond if they wish to participate) stop shaving between the start and end of harvest, then the beardy king is crowned during the weekend of festivities. It may be slightly exclusive (i.e. there hasn’t been a female winner so far), but it sums up the irreverence and bonhomie of the region. The Bot River valley is a natural bowl ringed by mountains. The valley heats up, but there’s a stiff breeze from the sea eight kilometres away to compensate. Soils are mostly decomposing shale over clay, which Niels says is “Cool and rich,” with pockets of Table Mountain sandstone, which tends to give racier and fresher wines. With slight incongruity given this boisterous crew, we finished the tasting with tea, cucumber sandwiches and scones with cream and jam being served. These guys take themselves just seriously enough, and whilst Luddite remains the superstar of the region, there are other names here that are well worth investigation. With a modest 12.6% abv this has a delicate nuttiness and honey, with nothing showy or overt. There’s a suggestion that this is very ripe, very fine, and onto the palate it has a lovely balance between fresh, clear, running water clarity and the subtle concentration of the fruit. A touch of lime peel and melon peel, juicy fruit but a resolved clarity and harmony too. A delicate but deliciously drinkable style. 89-90/100. A different beast with 14.46% abv, a blend of 32% Mourvèdre, 27% Pinotage, 27% Shiraz, 13% Cabernet Franc and 1% Petit Verdot. Gorgeous, creamy and lifted red and black fruit, with plenty of cassis and really ripe blackcurrant, lots of cream and cocoa, lots of plushness but has a suggestion of a firm backbone. The palate is juicy and has a big, lean, slightly gamy focus with chocolate covered cherry. The palate is smooth with really nice quality of oak that adds a smoky swirl and touch of plum skin, tart freshness. Lovely length. 92/100. UK importer of Luddite Wines is Caves de Pyrène. See all stockists on wine-searcher. All barrel fermented in old oak, “all sorts of ferment on skins,” according to Niels. Lovely fresh colour and lots of flinty, mineral smokiness, some soft green herb notes too. The firm, crisp apple is there, but this is more about something mineral. Is there a touch of oak on this? It certainly has a little of that nutty quality, a touch of something toasty, but that could be minerality again expressed as a flinty, racy character. The sweet mid-palate ripeness and richness builds in a complex, long wine with concentration. An intriguing expression of Chenin. 91/100. Meaty, gamy, northern Rhône style with lots of dark mulberry fruit and hints of chocolate, there are hints of leafiness and complexity too, a touch of pepper in a very attractive, complex nose. Beautiful palate. It has the sweetness of fruit of the Paardenkloof, but adds substantial layers beneath of full, creamy textured oak and plum, the tannins very svelte and creamy on the mid palate, and the spice and pepper filling in on the finish with a powerful freshness and length. 92/100. 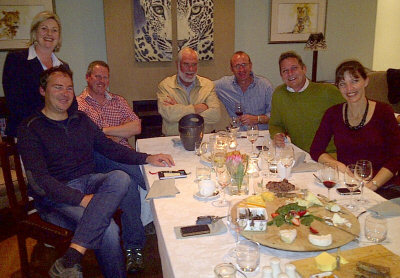 UK importer of Gabrielskloof is Ellis of Richmond. See all stockists on wine-searcher. 52% Semillon fermented in 500-litre casks, Romanian and French. The Sauvignon Blanc is unwooded. There’s a creamy, gently almondy and toasty note here of barrel ferment, with the buttery and lemony aromas to the fore, much more white Bordeaux than Loire or NZ. The palate is very fresh, very vibrant, the lemony freshness coming through powerfully and the white fruit and mineral acidity. Does it have a slight hole in the middle/disjointedness? Very impressive, but perhaps that transition from creamy to crisp needs to be smoothed a little. 89/100. A big wine at 15.1% abv, this is 28% Cabernet Franc, 25% Cabernet Sauvignon, 20% Merlot, 20% Malbec and 7% Petit Verdot. Big, coffee dominated nose, the Cab Franc, just about showing through with a freshening touch, plenty of spice and cedar is quite classic, certainly power here, but also a sense of clarity. On the palate it has a lot of dry extract, a lot of alcohol too, just giving a little heat, but again the quality of fruit, wood and the ripe but grippy tannins and acidity all nicely balanced. If this could have been a degree lower in alcohol with somehow the same phenolic ripeness, it would have been even better. 90/100. UK offices: Barton Vintners, Tel: 01489 878673. See all stockists on wine-searcher. Fresh, a touch of lemon and leafiness, though not hugely distinctive. The palate has fine juicy freshness though the ripe sweetness of the fruit is what makes this gently tropical and easy to drink. Dry in the finish, not complex but balanced. 86/100. Creamy and gently earthy red and black berry fruits, this is direct and ripely juicy. The palate has a lean streak of firm, quite tight plum and black, tart fruit skins. There is a little coffee and earth in the finish, a roughening rustic tannin grip and enough fresh acidity. 87/100. See international stockists of Wilderkrans on wine-searcher. Made from Chenin Blanc. Fresh and appetising nose, with a touch of lime and lemon, but mostly a ripe apple fruitiness. A rolling, rich mousse, with a lovely sour apple and sour lemon fruit and acidity, with plenty of flavour and a nice element of toast to marry with the lovely apple acids. 88-89/100. This is made with 8.6g/l of residual sugar, so is just off dry. Much deeper, more yellow colour. Nutty, touches of nectarine or pineapple, a touch of syrup or honey on the nose too, some vanilla again. On the palate this is a big wine, the RS apparent, and against the structure and power of the wine it feels a little hot in the finish, perhaps a little disjointed. 86/100. 14.5% abv. Subtly rich, deep and creamy, the oak giving a deep sheen and gentle mintiness, even violet, just a touch of chocolate but nothing too showy in terms of the wood. The black fruit is rich and ripe, fleshy on the plate, showing a lovely weight and texture, plenty of sweetness, but a cut and freshness too. The juicy finish is beautifully judged, the oak again tight grained and fresh, though it does have spice and chocolate. 90-91/100. See international stockists of Eerstehoop on wine-searcher. Nicely earthy, a touch of game and animal quality here, the solid cassis and black fruit with cedary and incense finesse, but mostly about the black fruit. The firmness is there on the palate too, juicy, a big squirt of tart black cherry and blackcurrant, seems to have plenty of acidity and a freshness about the finish despite an impression of fruit sweetness. 88/100. See international stockists of Genevieve on wine-searcher. Specialises in Cap Classique sparkling wines. With only 10% abv, this cuvée is made from 100% Chardonnay. More yeasty autolytic notes here than the Wilderkrans, a touch of oak perhaps adding a creaminess and touch of buttery quality. On the palate it is creamier and richer too, with a delicious apple and snap of orange and lemon to the acidity. Stays full, but very nicely dry and crisp, very citrusy and juicy. 89/100. See international stockists of Feiteiras wines on wine-searcher. Only 12.68% abv and plenty of aroma here, plenty of lemon verbena and touches of leafiness. The palate is bone dry, and racy, that acid keeping the picture sharp if not complex. 85-86/100. 14.5% abv and a blend of Merlot, Cabernet Sauvignon, Petit Verdot and Shiraz. Quite freshly spicy, a touch of cedar, the fruit savoury and quite racy on the nose, with a little more vanilla coming through. The palate has really nice balance between sweet, ripe and full fruit and the racy leanness with a bit of tannin, though that is soft and gentle, and decent, with a lot of spice and really nice fresh character. 88/100. See international stockists of Paardenkloof on wine-searcher. 12.5% abv, with plenty of elderflower and thiol character, with a gooseberry freshness and hint of passionfruit. On the palate it has lots of juicy freshness and it is very dry, though perhaps a touch less decisive, a little hint of dilution, but fresh and appetising. 86-87/100. 15% abv, there’s a slightly odd, vegetal and animal notes at first, a bit reductive perhaps, or is it just meatiness and oak character? Blows off, leaving a deep and quite meaty character. On the palate intense sweetness to the fruit, it is big, sweet and creamily ripe stuff, the tannins very ripe and smooth, the finish juicy, a real squirt of cherry to freshen. 88-89/100. See international stockists of Rivendell on wine-searcher. 12.5% abv, this is quite pungent and green, with loads of herbs and rosemary and dill, a real streak of herbaceousness over lemony fresh fruit. On the palate it has a really nice concentration, the fruit retains that herbaceous bite, but the apple and fresh, lemon really streaks through into a decisive, dry but long finish. 88/100. Shannon’s farm sits a little off the beaten track. The most westerly farm in Elgin, it is beautifully sited on the Palmiet River, a leafy, shady place with stunning watery views in every direction. The farm grows apples and pears as well as wine grapes, and was busy bringing in a bumper crop of Braeburns on my visit. I met up with James Downes, a shrewd and affable character who has had the most interesting life: a qualified marine biologist, work took him to Aberdeen in Scotland to study for a year. Nine years later he was still in Scotland working first in Aberdeen and then setting up fish farms in the Mull of Kintyre. Returning to the family apple farm, James took on the role of viticulturist, planting the family’s first vines in 2000, 15.5 hectares on virgin land to join the 35 hectares of orchards, “But we have a coal mine on the Traansval that finances the whole project,” quips James. 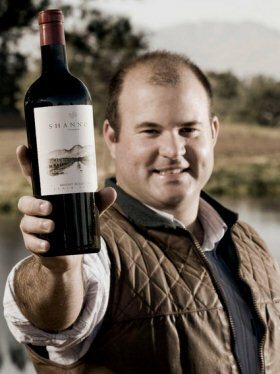 James runs Shannon along with his brother Stuart, whose career in wine business marketing included the launch of the Cono Sur label when he lived in Chile. The farm still sells 75% of its grapes to clients including Tokara and Mulderbosch, and the first release under their own label was only in 2008. For now the wines are made at Newton Johnson winery, though James is “Involved in all stages of the winemaking, heading up the blending panel and so on.” James explained to me that even by Elgin standards, this is a cool spot: “Grapes from the farm ripen a week later than on Paul Cluver’s farm,” he tells me, on their vineyards which have rocky soils, with sections of kaolin clay, table mountain sandstone and silica. It is farmed organically, though not certified, with clover and lupins sown as cover crops in winter. 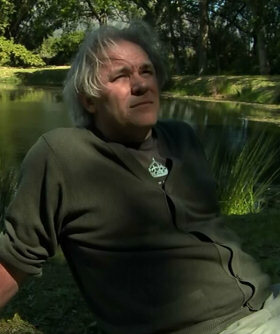 James also tell me that they currently have a troop of 70 baboons resident on the farm, which excites him as a biologist: “The more top-end preditors you have, the more it indicates the biodiversity success of the farm – we have otters, raucous toads and eagles.” I ask if the baboons do much damage in the vineyard, but James is unphased by the fact that they do: “So the baboons eat 0.04 of our production,” he says. “That’s nothing compared to a heatwave or attack of moths that can destroy 15%”. Fermented with natural yeast, there’s little bit of Semillon in this and 11% of the blend is fermented in barrel. Nicely leesy, fruit skin nose, traces of soft green herbs but really more about lemon and a certain mineral saltiness. There is a background of more tropical, mango and lychee. Delightful palate, really refreshing crunch and crispness, with deliciously tangy lime and grapefruit, that vivacity playing against sweeter, more exotic notes but lovely structure and length. 91/100. 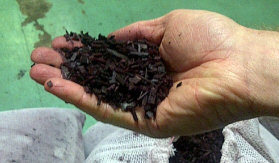 Only about 30% new oak is used here, but James says they have moved away from charry barrels. He is looking for spice not smokiness. James says “This always sells out, but I like it staying just below the radar.” Lovely pale colour, delicious herbal edges to this, even a touch of camphor, gentle vegetal quality, with delicate nutty notes and dry red berry fruit – very attractive. The palate has delicious red fruit at its core, it has an intensity, but a very tight, finely wrought style, but then there is generosity with more spice indeed, pepper and truffle and damp undergrowth essence. Delicious. 92/100. “Our front row forward in the line-up – broad shouldered,” says James. Made with wild yeast in a slow ferment, the dark, saturated colour comes from a blend of three Merlot clones; two from France and one from Italy. Lovely oak quality, spicy and fragrant, with ripe, plummy but bouyant fruit, lots of fat red and black berries and plum, but that fragrance also has little meaty and savoury, almost meat stock character. Very attractive. The palate has delicious sweetness, the intensity of the berry fruit and the silkiness of the texture through soft, giving tannin structure. Good spice again, the juicy character of the fruit and elegant cherry acidity really nice into the finish, just hints of more chocolaty and dark plummy charcter amognst the fresher elements into the finish. 93/100. “More of an academic excercise,” according to James. Discovered/created by accident, two hectares of Pinot allocated to sparkling wine production were not picked and forgotten about. James came back a couple of months later and the bunches all had Botrytis. He took it to the winery and tasted with Gordon and Nadia Newton Johnson “and it was clean.” So he experimented the next year with a Pinot Noir Straw Wine, but it didn’t really work. So in the next year, 2009, he dedicated 22 rows to making a sweet Pinot that ends up with around 132g/l residual sugar, both through Botrytis and Dehydration. With wild ferment over many months in old barrels, it is not produced every year – this is the first since that 2009. Light pinky colour, very delicate on the nose, light, rose style strawberry and raspberry (match with chocolate or with berry fruit desserts). Delicious palate, the beautifully creamy, sweet balsamic strawberry character is delicious, lovely sprinkling of pepper and spice. Delicious stuff with a light to medium body and nicely retained acidity adding a lovely sour cherry freshness. 91/100. In half bottles, a few restaurants have it in the UK. Partners Natalie Opstaele and Joris van Almenkerk arrived from Belgium with plans to set up a wine and farming business, but never dreamt they would end up making and selling their own wine. A successful lawyer, Joris arrived intending to practice law, but things didn’t quite work out like that: “We bought the apple farm, and worked with a team of vineyard and winemaking consultants at first,” says Joris. 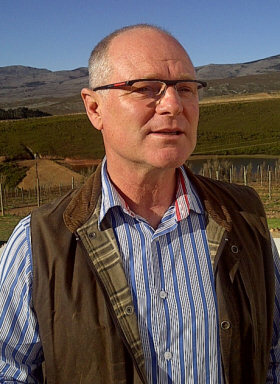 “But we soon decided I really needed to be the one who took the decisions, so off I went to Stellenbosch to study winemaking and viticulture, whilst still doing some legal work for private clients.” With 15 hectares planted to vine, Joris says he does not want to grow any bigger: “We are a registered wine estate, one of only 90 left in South Africa who are registered to use only their own grapes.” The business is successful, but the wines are not exported to the UK – about half goes to Belgium and half is sold locally. “I would be happy to be in the UK,” says Joris, “but we don’t want to go looking – we want an importer to come to us, someone who is here because they want our wines, not someone who agrees to take them at a knock down price.” They do sell apples to Tesco, but Joris says “there are so many audits, paperwork, and expenses to get wines into the UK supermarkets now that it makes the UK unattractive.” Indeed new plantings will be of apple trees, not vines, “because apples are easier to sell,” according to Natalie. The Almenkerks seem happy with how things stand however. They are in the centre of the Valley here, in a beautiful spot enclosed by mountains, and from their first vintage in 2009 the wines were well received. A very smart new winery and visitor centre looking out over the vineyards and orchards is impressive too, and whilst expanding the wines business is not on the plans, that does not mean the keenly intelligent, always inquisituve Joris is resting on his laurels: “We’re just grafting our Malbec over to Petit Verdot,” he tells me, “because Malbec hasn’t worked.” Lawyer, winemaker, businessman – the pragmatic approach to making Almenkerk work seems unshakeable. This is totally reductive wine making with no oxygen: an special press pumps inert gas into the press bladder as it is deflating to exclude oxygen. Distinctive, green apple juice nose, fascinating perfume with that green-tinged herby edge, but fresh and smooth bite to the aroma. Very juicy on the palate, crunchy green apple again, but ripe, a touch of pear, and a big scything background of lemon and lime freshness, hinting at minerals and a touch of nuttiness. 89-90/100. No sulphur is added until the very end of winemaking which Joris says “Needs meticulous, clean grapes and maximum hygene.” The opposite of the Sauvignon this is pressed with deliberately oxidative handling, the juice very brown to begin. Natural ferment in barrel with the lees, all 225-litre French oak barriques, around 20% new. No malolactic, no stirring, just rolling barrels. Beuatiful fragrance here, the exotic, delicate wreathing vanilla, almond and perfumed, blossom and incense nose, a fine lime fruit. Delightfully fresh on the palate, with green apple bite, that little nuttiness and such lovely shimmering acidity. Just delightful. 5.9g/l of residual sugar disappearsinto the acid and refined fruit balance. 92/100. This has 15% Cabernet Franc and a blend of three Syrah clones, and is an individual barrel selection picked on taste rather than analysis. Wild yeast fermentation and extended maceration before 16 months in all French barriques. Lovely spiced, fresh and buoyant fruit, with deep, rich berries, mulberry and blackcurrant, a touch of game and truffle, but really focused on the fruit. Lovely sweet fruit on the palate, with a dry, nicely extracted fruit concentration, tight and racy, the tannins quite grippy, but smoother too, and with creaminess to the fruit texture and a lovely acid balance, this has really nice style and length. Finishing juicy and fresh. Clones used are 22 (“Gives some Barossa style,” according to Joris), 29 (“Meaty”) and 7 (“Spicy”). 91/100. Second selection of Syrah that does not make Almenkerk, blended with Merlot, Cabernet Franc and Malbec, plus a little Viognier. Has around 6g/l of RS “which people love.” Delightfully ripe black fruit comes trhough on the nose, with bountiful red fruit, a touch of coffee and chocolate from 2nd and 3rd fill French oak barriques smooths and rounds this out. 87-88/100. Made for an English couple Tim and Maz Walker who run a local project to shelter and foster Aids orphans. They had some trellised vines hanging over the balcony of their property, so Joris harvests these and supplements them with his own grapes. One barrel was made which will be shipped to the UK and auctioned for the charity. Nice lifted nose, clove and cherry and rosy red apple. Dry on the palate, with some nice fresh, biting fruit and a bit of real juiciness and dry finish. It is mostly Mourvèdre. 88/100. See worldwide stockists of Almenkerk on wine-searcher. There’s also 8% Semillon in the blend here, the wine fermented in very large old barrels. Lovely, passionfruit and tangerine nose, lots of punch and freshness, and hint of elderflower, just hinting at lychee and mango. On the palate, there is a rounding, ripe, juicy stone fruit and more exotic flavour, lots of passionfruit and that nice lime and grapefruit freshness. 89/100. Only 11% abv and a delightfully mineral nose, gently waxy and smoky, lovely apple and lime skins at the heart of it. The palate has delicious, squirting orange and lime juiciness, with a lightly oily mouthfeel, terrific acidity that is dry in the mouth and gives this lovely freshness into the finish against the 8g/l of residual sugar. 90/100. Will be called ‘Dry Encounter’ in future vintages. And only 10% abv for this cuvée that is sold in M&S. The name refers to the Ferrecrete or Coffeklip shale on which is it grown. Delicate, more sherbetty tones here, with apple and that touch of waxiness coming through, seems very delicate and Kabinett in character. Deliciously light on the palate, 18g/l RS, pure, long, off-dry finish with that tight sherbet lemon character. 90/100. This Spätelese style wine has a mere 8% abv and 35g/l of residual sugar thought with over 8 g/l acidity. This was named after a previous vineyard manager who’s truck was hit by a train on the track that runs through the farm but came out with a broken collar bone only. Lovely pure, mineral-touch gentle lemon and lime nose, a hint of blossom. Quote a rich mouthfeel, with the sweetness like juicy red apples and a touch of lemon zest really freshening it up. 90/100. 12.5% abv. Gently toasty, gently exotic, but not a flamboyant style, with a lightness, and leanness that is very pleasing, just enough of the blossom and exotic character, but on these soils we have to retain the acidity, so cannot make a fat style of wine. 10g/l residual sugar just to take the edge off of it, but it remains racy and fresh. 88/100. 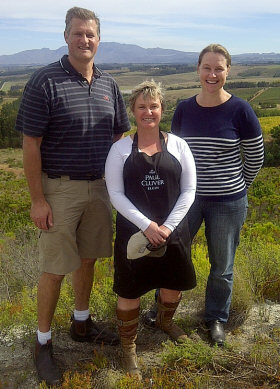 For their Chardonnay and Pinot the Cluvers work with Martin Prieur from Domaine Jacques Prieur. This is 100% barrel fermented with ambient yeast, 30% new, and stays on the gross lees for nine months. Plenty of buttery toast, Brazil nut and richness to the fore, but the cool apple fruit and a bit of zesty lemon aromas comes through. On the palate delicious, with a huge oatmeally rich layer to the ripe, rosy apple and fatter lime. Delicious acidity, the finish long and has delicate nuttiness and a touch of vanilla as well as plenty of juicy citrus acidity. 90-91/100. Finely wrought cherry and light charry note, with something a little truffly and edged with a pleasing green note – but nicely so, just a little savoury and herbal. The palate has good fruit, red and black berries, with delicious lick of acidity. Not fantastically complex and perhaps could have a little more flesh on the mid-palate. 89/100. Made from a single block planted in gravelly soil in 1990. This is a barrel selection of the best of that block too and only 250 cases were made. Very nice edges of char and toast, but more about earthiness and touches of vanilla, but there’s a little more concentration already on the nose, Firmer on the palate, an edge of liquorice and endive, but the softer, juicy cherry and raspberry is there to balance, with really nice, fresh, juicy cherry skin and lemony acidity. Again, perhaps a touch more fat in the mid palate would benefit. 90-91/100. In fact the estate now consists of 62 hectares of vineyard, 50% of which is Sauvignon Blanc, with 5% of Semillon as well as Nebbiolo, Shiraz, Cabernet Sauvignon and Merlot. Steenberg produces four levels of Sauvignon Blanc including a barrel-fermented cuvée, and the Reserve which comes from a block of 23-year-old vines. John says “These old vineyards are now losing leaf, so we are planting new vineyards with new clones which are coming on stream, and which we feel are giving even better fruit.” Their impressive ‘Magna Carta’ is a Bordeaux-style white which, when first released in 2001, was “ahead of its time,” according to John. “It was an uphill struggle to sell it, so it was dropped, but fashions change and by 2007 we decided to reintroduce it as our top-end white.” At 400 rand per bottle (around £26) it was South Africa’s most expensive white at the time. Only around 250 cases are produced but its success will see that grow to 500 cases in future. All steel fermentation, lots of lees contact for 90 days, then fine lees for 6 months. Low yields of 2 – 3 tons per hectare. Bright green bean pyrozene aromas. Plenty of oily bean and asparagus here, but then tropical fruit comes through. Plenty of fruit sweetness on the mid-palate, but nicely balanced, long and filled with nice greener and sweeter notes and very good acidity. 89/100. Back label says “last from the old vineyards”. More minerality here, less of the green, but really nice punchy fruit, the sherbet-edges, the crunch of lemon sorbet, very crisp gooseberry. Terrific acidity here, a pithy and zesty minerality, passionfruit and terrific zip and tang. 90/100. Around 60% of this comes from the new vineyard and will be launched as a new wine replacing the Reserve. A touch of smokiness and mineral character here is really very appealing, plenty of green pyrozene crunch and lots of salty mineral freshness. Those passionfruit and guava tropical notes are pronounced, but again a delightfully zesty grapefruity tang. 90-91/100. Barrel Fermented in 2nd fill 500l and 600l barrels with a very small proportion in newer barrels, and pure Semillon from a 21-year-old vineyard, a French clone smuggled in from Bordeaux during the apartheid years. The only property in SA with this clone. Beautifully buttery and creamy nose, lovely rounded lemon peel. Lovely nuttiness and a hint of lanolin, but delightful clarity and hints of the more exotic orange and blossom. Drinking beautifully, the sweet fruit flooding the mid-palate, with plenty of apple core, dry acidity and a long, fresh finish. Delightful wine. 90/100. A lot deeper in colour, Toastier, a little less full with a greener, herbaceous edge. Nutty and lemony beneath. Full, rich, very fine palate, perhaps a little less decisive, more of the oak adding the cashew and toastier notes, buttery but fresh enough and still drinking very nicely. 88-89/100. Bright, minerals to the fore, a little gravelly note and some gentle nutty and smoky quality too, the oak fragrant and lightly handled here. Cashew and lemon, a touch of nutty apple. Real fresh on the palate, the white fruit and citrus really powering through decisively, the fruit really has intense sweetness and concentration on the mid palate, but lighter, more dancing and orangey in the acidity. 91/100. Bordeaux White. 40% Semillon, 60% SB. Semillon barrel fermented, some new, SB unwooded. Again that oily green bean punch comes through, but so does a lovely soft vanilla smokiness and toast, and lovely blossom and some exotic spices and seeds. Juicy and full on the palate, has all the oily, full, juicy fruit and hints of exotic ripeness, but there is such a lovely core of minerality and the rounding, smoky swirl of soft oaking means this drinks with beautiful length and balance, and will age further. 94/100. The vintage currently with Armit in the UK. 35% Semillon, 65% Sauvignon Blanc. From this vintage on, both components barrel fermented, blended and back into old 500l barrels for another 11 months. Delightful honey and perfumed, bright, floral and sesame lightness, lovely blossom delicacy, the oak very fragrant and soft beneath. The palate has lots of those pure, racy, slightly green flavours, a touch of green fig and of grassiness, and very nice racy fruit quality. Lots of juice and greener notes, but very pleasing. 92/100. 35% Semillon, 65% Sauvignon Blanc. Very fresh, very pure and bright, the creaminess and oatmeally qualities are delicious, again that minerality comes through with touches of lanolin and gravelly minerality, the fruit powering through with a grapefruit and lemon zest and pithiness, really concentrated in this vintage, but those blossom and lighter almost sherbetty characters are there and the subtle oak underpinning. Terrific and young wine, showing lovely intense minerality. 93-94/100. Last time I met up with Duncan Savage, winemaker at Cape Point Vineyards, was for a tasting and lunch at the nearby Food Barn restaurant where chef Franck Dangereux cooks up a storm. So it was a pleasure to visit the estate this time to see the vineyards and the unexpectedly popular visitor facilities that were thronging with scores of people tasting wines and enjoying the stunning views to False Bay on my visit. “We have just built this new cellar, and the tasting facilities and a restaurant,” Duncan told me, and its success as a destination for Cape Town’s wine lovers has been instant with the traffic jams for their Friday night barbecue almost closing the main road leading to the winery. 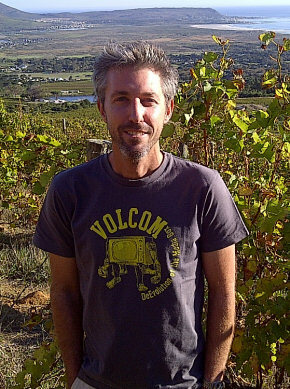 Duncan sites the four months he spent working with the late Didier Dagueneau in the Loire Valley as his inspiration for a career at Cape Point which has seen him seeking to make South Africa’s most profound expression of Sauvignon Blanc. To that end he uses some Semillon in his blends and ferments and ages proportions of wine in barrels and in amphorae to add complexity to his various cuvées. Duncan says 2013 is “looking amazing,” and will be up there with the best recent vintages like 2005, 2010 and 2012. “It’s bloody nice fruit and the biggest crop,” he tells me. 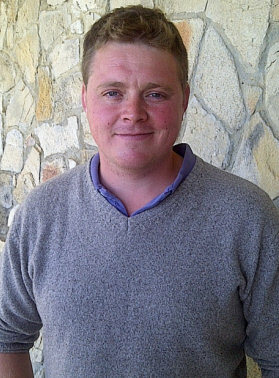 A man with an eager, restless mind, Duncan also plays constantly with the style of his wines. For the top cuvée called Isliedh he says “We’re keeping the canopies much tighter and giving much more sun exposure than we used to. That will get really ripe, physiological and fruit sweetness without losing any acidity. I don’t want the pyrozene or thiol character of a shaded canopy.” My visit also coincided with the release of Duncan’s own side project, called Savage Wines. Initially a very small release of just two wines, a white and a red blend, there was much excitement around these wines which sell for 180 Rand locally, and which Duncan hopes will come to the UK eventually. There’s a little Semillon blended in (10%) and this was 20% barrel fermented in 600-litre old barrels. There’s a lovely juiciness and passionfruit to this, some lychee and mango tropicality, the herbaceous character in the background, and plenty of fruit and freshness on the palate, a really nice, tight, mineral acidity and lemon squirt of acidity. 89/100. Tank fermented, with just 4% in barrel. Lovely fragrance here, the passionfruit and gooseberry again, the tropical subsumed by a little more pyrozene green too, but not at all overdone. Very tangy, lovely acidity again cutting through the nectarine and guava fruit. 90/100. Just taken out of the older barrels where it had been “for a year or so.” Whole bunch pressed, and fermented with 50/50 natural and inoculated yeasts. Has more wild yeast character, with a gently earthy note, perhaps from the stems too, with a touch of clove and wheat, the palate showing a really tight lime fruit. 90-91/100. 25% Semillon here, along with a specific block of Sauvignon Blanc, blended straight after fermentation. It spent 10 months in 600-litre barrels, half new and half second fill. Much more open and passionfruity, delicious notes of guava and a lightly almondy, creamy character in the background. The palate has superb precision but balanced with a really lovely, poised, svelte character showing that blend of creamy richness and mineral precision and grapefruit cut. 93-94/100. “We were going to yank out the Chardonnay,” says Duncan, “but we have such a big following here.” Big, creamy, hazelnut nose, with lots of creaminess to the orchard fruits and lemon peel, lots of lime and tangerine to the acidity, the oak creamy and round and those hints of pineapple and riper, tropical fruit are delicious and it has good length. 91/100. This wine doesn’t come to the UK. From more inland vineyards, this blends 70% Sauvignon Blanc from vineyards that are 700 metres above sea level in Kaimansgaat, Walker Bay, with 30% Semillon from 50-year-old vineyards in Clanwilliam on the west coast. Lovely thin layer of cashew or almond over ripe and apple fruit, but with a little spice and a little gooseberry, tight and mineral. The palate has superb clarity and freshness, but there’s a limpid, racy fruit quality to the acidity as opposed to the Isliedh’s overt minerality, and that lovely gentle nuttiness. 92-93/100. With only 12.5% abv, this blends 71% Syrah, 21% Grenache and 8% Cinsault from maritime properties in Darling, Piekenierskloof and a small vineyard near Cape Point. Plenty of herbaceous, olive and lightly green and earthy aromas, a touch of something resiny, but very pleasing and inviting. The fruit has a fine, dry, tight black cherry and blackcurrant fruit, but very tight. Really brightly focused fruit, the Cinsault giving a real tight, red fruit cut, then the riper, more svelte black fruit takes over, the acidity crunchy and juicy, the gentle spice and then lovely cherry ripe note to the fruit is what lingers. 91-92/100.